Special shaft collars and couplings that can be machined from wide range of materials to meet strict OEM design requirements are being introduced by Stafford Manufacturing Corp.
Stafford Special Shaft Collars and Couplings can be machined to customer specification from a wide range of materials including Hastelloy for high temperature applications, various stainless steels, bronze, and brass for corrosion-resistance, weldable materials, and specialty materials such as titanium, and a host of other alloys and engineering plastics. 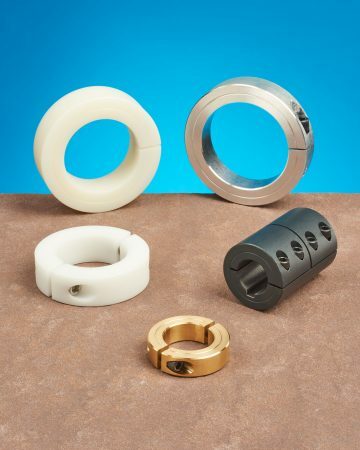 Supplied in prototype through production quantities, Stafford Special Shaft Collars and Couplings can range from 0.25” to 14” I.D. for shaft collars and 0.25” to 4” I.D. for couplings. Bores can be hex, round, and square, with keyways or threads and the face and O.D. can include cams, flanges, flats, knurls, laser etching, levers, slots, and tapped through-holes. Stafford Special Shaft Collars and Couplings are priced according to material, configuration, and quantity.